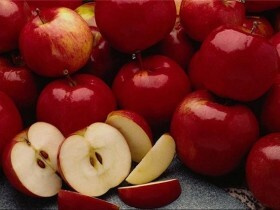 To every year to collect a good harvest with apple, necessary for it to produce Care: feed and crop. This article is about, how to cut an apple tree. Pruning engaged in spring and autumn. In winter, you should not do, extreme cold can only hurt. Spring gardeners begin to cut the trees before flowering. It is at the end of March - early April. Would like to note, that a full crop can withstand the trees age of five years. They are already more consolidated. The young apple trees only form a crown, cutting off all the branches to the desired length. Stem branches do not touch. Circumcision of adult tree is made in two stages. first decimates, then shorten. Before you thin, We need to decide, which branches to remove. Visually inspect the entire crown. Allocating extra appendages, We start trimming. Important! Trim all in one day it is not necessary. Do not expose the tree to such stress. Every day, we remove some branches. If the apple tree high, shorten it, cutting the top of the barrel. Then remove those branches, are withered, interfere with other, block access of the sun and those, that grow inside. You can do with these tools, like a saw and pruner. Pruner is needed to thin twigs, and saw, respectively, for thick. thinned, We begin to shorten. The basic rules are as follows. slice do, without damaging kidney, a bit higher. If you need to crop a part of a branched, the cut on the spot, where branches diverge. Another point. The upper crown branches are exempt from, growing up, and the bottom - from the, that pulled down. This will allow the apple tree grow equally wide, not high. Autumn pruning produced before the onset of cold weather, more precisely, frost. In late September - early October start to cut apple. Pruning takes place in the autumn of the same principle, and that the spring: remove weak and dry, clipped incorrectly growing branches. 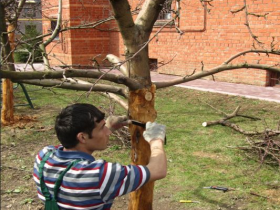 After cutting it is important not to damage the stem bark. Knots not leave, as they still wither and, dumps, form a hollow apple. A hollow - is the death of the entire tree. Therefore, the resulting stump should be removed, podpiliv, first in the direction of the barrel, and then align the saw cut from top to bottom. When you have finished trimming procedure, be sure to treat all sections. What you can do? paint, plasticine, lime with copper sulfate solution or to wrap packages. The most reliable way - oil paint. why cover up? We inflicted wound tree. It should not be open. gets wet, in this regard, will multiply pests, Hemp will rot, and the apple tree - get sick and eventually die easy. Of course, cuts will be many. Gloss over minor troublesome, so we treat only large. From small great harm will not. Young apple tree oil the next day after trimming, but a mature tree - immediately after the procedure. All useful things done, do not forget about cleaning the area. All trash after trimming is required to remove, and it is better – to burn. If you do not, can get sick all the trees of the garden. Uncleared waste - a good climate for the development of microbes, which are able to destroy all plantings. 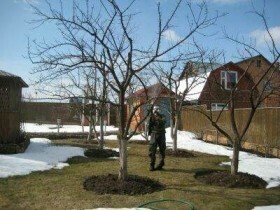 AND, at last, if anyone - who doubt the usefulness pruning apple trees. Trim apple very useful. trees circumcision contributes to a better fruiting. Fruits ripen more quickly and do not spoil. Pruning prolongs the life of the tree. BUT, only tree, neatly trimmed and well maintained, will decorate the garden. And why buy in a store apples, if you have your.